Right now two major museums, on opposite coasts of the United States, both have exhibitions on the Kimono. The Los Angeles County Museum of Art has Kimono for a Modern Age (through October 19, 2014) and the Metropolitan Museum of Art in New York has Kimono: A Modern History (through January 4, 2015). This unique situation requires a unique review. And so, I’m happy to present two simultaneous reviews of the two exhibitions by two experts in the field: Brenna Barks agreed to review the LACMA exhibition, and Nadine Stewart reviewed the Met’s exhibition. Below are their reviews. Happy Reading! Little attention is paid to what can be called the decline of the kimono in Japanese fashion. Most museum-goers, and thus most museum exhibitions, concentrate on the “expected”: what is seen as the traditional, soft, delicately patterned kimono that so inspired the Impressionists and the patrons of Japonisme. Indeed, this is the majority of kimono. However, kimono – like all clothing – followed fashion. And the fashion during the last “heyday” of the kimono is the subject of the Kimono for a Modern Age exhibition at the Los Angeles County Museum of Art (LACMA). 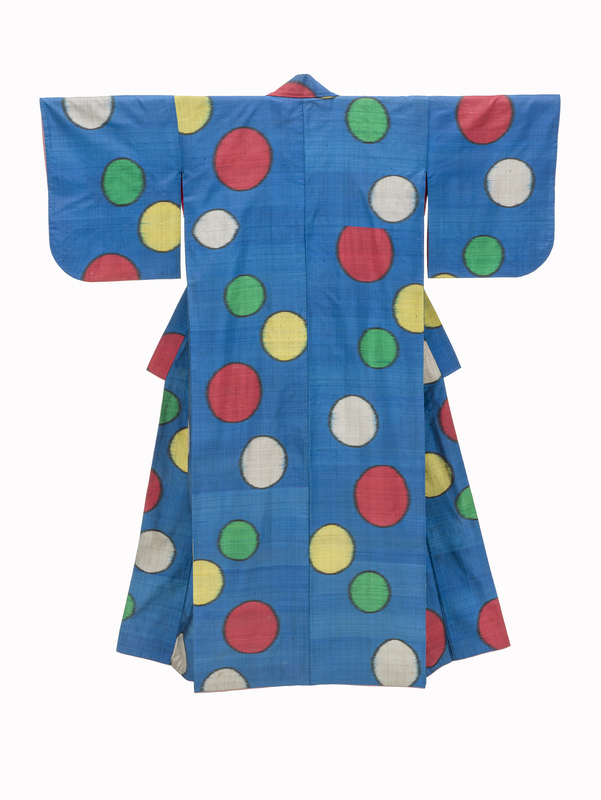 Leading up to and immediately after the second World War, while the traditional patterning remained popular, a new style of kimono emerged: the meisen. The fabric for meisen is unusual in that the warp and weft threads were stencil dyed individually before being woven, creating a marvellous faux-ikat pattern. These patterns were typically large and boldly coloured, contrary to the expected tradition. Much has been made of the influence that the West had on the patterning of meisen – and LACMA does point out the references to Art Deco motifs or motifs taken from famous Western painters, such as Matisse, in the exhibition. But what LACMA does with their exhibition of over 30 meisen is to properly place them back into context within the Japanese tradition. Yes, there are Western art influences, but predominantly meisen were reinterpretations of Japanese art: landscape paintings, calligraphic motifs, and more often new, bold re-imaginings of traditional Japanese kimono patterns such as arrows or dewdrops. Some of these re-interpretations can even be seen as forms of protest against American occupation after World War II. At least two meisen in the exhibition feature the Japanese war flag of the rising sun being not-so-subtly worked into the pattern. One in blue as a vague “star” pattern, another into what would otherwise be an image of dawn over a village. Or perhaps instead of open protest, these patterns were a silent message of surviving patriotism and a hope that they would rise again after re-inventing themselves as well as their traditions? 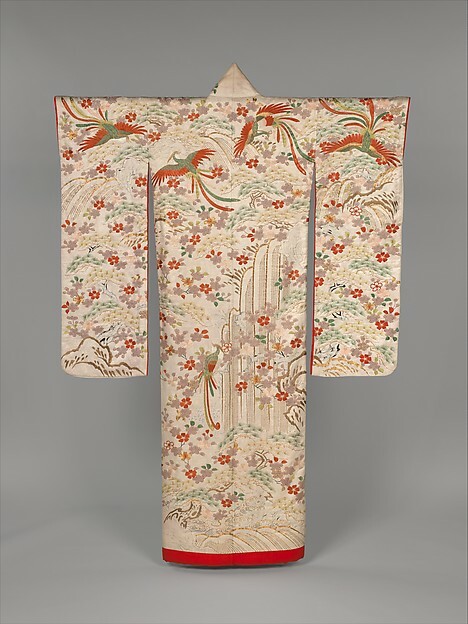 LACMA masterfully and tactfully addresses the subject of war and occupation, tradition and fashion head-on through the display of such kimono and their thoughtful, well-written tombstones about each piece. 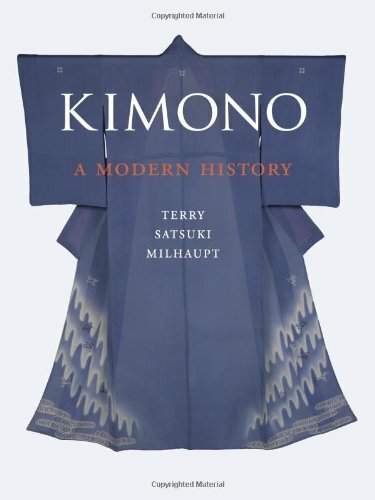 Kimono: A Modern History is a stunning exhibit, not to be missed. The fifty kimonos on display span the period from the eighteenth century to the present day, a time when the kimono evolved from a garment worn by the nobility and the peasantry. Though “kimono” literally means a “thing to wear,” this exhibit shows how much more this garment has meant to Japanese culture over the centuries and how it has influenced fashion in the rest of the world. The first things on display are swatch samples from the Edo Period (1615-1868), exquisite examples of tapestry weaving in silk and silver thread. In one piece the fighting dragons are made entirely of tiny French knots. In another, we see Western ships with their flags, a reminder that Japan opened up to the West in this period, which would mean a new set of influences and textiles techniques would come flooding into the country. The kimonos in this section are the elegant silk padded kimonos for ladies of the nobility. The fabric of each one is an example of the highest level of craftsmanship–damask grounds overlaid with couched gold thread and silk embroidery. Elegant as they are, the kimonos are not the only items featured here. A beautiful inlaid cosmetic box with brushes and combs, a large screen showing dancers whose fluid sleeves accentuate their movement, and an etiquette book on how to dress give a sense of the special place the kimono had in this society. The entire exhibit is full of objects that amplify the kimono story from elegant prints that show members of the Japanese court mingling with Western men and women suits and bustles to a “Basket Derby” from 1880-97, a city style made from simple reeds to be worn by the Japanese dandy with his walking stick. Working class kimonos are just as beautiful as the kimonos for the nobility. Firemen in Japan wore heavy cotton kimonos with figures painted inside for protection as they fought the many fires in a nation of wooden buildings. The kimonos were soaked with water as the men fought fires. The designs inside were only seen during festivals when they were turned inside out. Even rarer, is a farmer’s kimono of recycled rags and a coverlet kimono worn over a person in bed, painted with image of a lobster, the symbol of longevity. A significant section of the exhibit shows how Japan and the West influenced each other from 1868 to 1912. The Japanese adopted Western chemical dyes and weaving techniques, while the Western fashion was swept up in beautiful images from Japan as these pieces from the collection of the Costume Institute show. 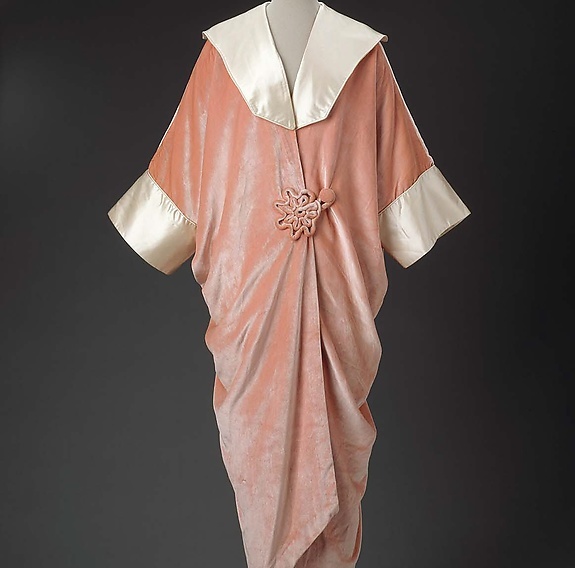 A lush pink silk velvet opera cloak by Jean-Charles Worth is displayed next to a kimono robe made by Tashimaya Department Store for the foreign trade. It features short kimono-like sleeves and a simpler printed fabric with Japanese-style motifs. Finally, a light green wool Western-style robe with frog closures features embroidered flowers, which are a fine example of Japanoism. As Japan moved into the twentieth century, the influences changed, the artistry did not. Modern inventions like cameras, express train tickets, and sheet music appear. Tow kimonos show sobering signs of the nation’s increasing militarism—one shows the siege of Port Arthur during the Russo-Japanese War and another, antiaircraft guns, tanks and planes backing Italy’s invasion of Ethiopia in 1935. Kimonos for the masses appear sold in department stores with design influenced by Art Deco and the De Stijl movement. There is even a child’s kimono treasured by Frank Lloyd Wright with a pattern of wisterias climbing over abstract trellises. After World War II, Japan began an effort to preserve its cultural heritage, preserving and honoring the craft of the kimono makers, weavers, and dyers through the Living Treasure Movement. Three kimonos created by these artists give testament to the beauty of their work. At the end of the exhibit are garments from prominent Japanese designers, who have brought the nation to the forefront of fashion while honoring their unique traditions—Hanae Mori, Issey Miyake, and Yojhi Yamamoto, and one more designer, Bonnie Cashin. Her simple black wool kimono-style coat shows her love of the Japanese kimono. It was a design she repeated often though her career. **Image: Woman’s Kimono (kosode) with Abstract Hemp-Leaf Pattern, Japan, late Taisho+ (1912-1926) – early Sho+wa (1926–1989) period, Silk plain weave, stencil-printed warp and weft (heiyo+-kasuri meisen), Los Angeles County Museum of Art, Costume Council Fund, M.2012.130.9.